With all the delightful flowers, butterflies and birds, it’s hard to imagine how you can experience any more splendor in your garden. Though flower gardens can hold their own, adding an arbor only intensifies the beauty of your outdoor sanctuary. Their striking detail and the way vines hug their posts is simply unmatched by any other garden feature. In this article, we’ll be discussing (with photos) 23 of our favorite garden arbor ideas to deepen the appeal of your home garden. The many black iron arbors lining this path are completely overtaken by plant life. 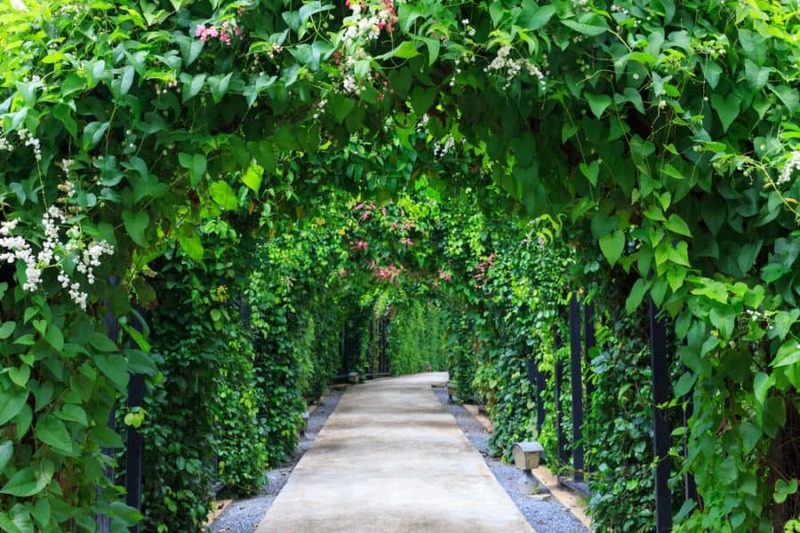 A walkway such as the one in the photo would surely add intrigue and wonder to any garden space as you stroll through this lively floral tunnel. Though you may not have the ability to include as many arbors in your garden, three or four arbors would likely have the same stunning effect. This sizable garden arbor encompassing a seating area is simply awe-inspiring. 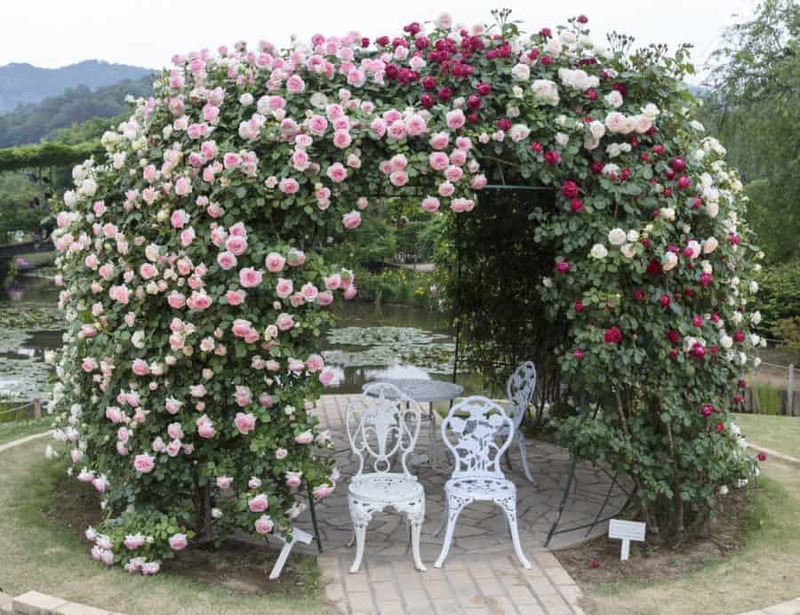 The rose-covered roof was (quite obviously) achieved by planting multiple rose bushes on the outside of the arbor to allow the vines to trail up the structure. Imagine sitting within this magical space, listening to the song of birds and watching butterflies flutter past you. What a place to spend your afternoons. If your home is set back in the trees or surrounded by greenery, what better way to enter your residence than by a beautiful, white arbor? This simple arbor would certainly make a wonderful first impression on your visitors as they pass through this arched entryway into your vibrant home and garden. 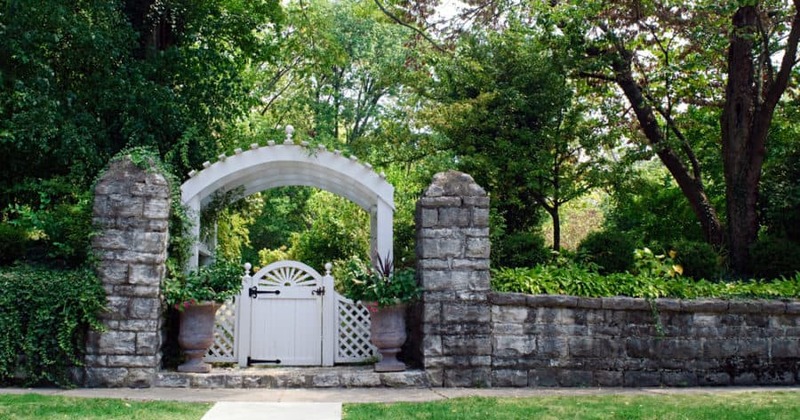 If you like different areas of your property to be separated, this beautiful stone wall with a gated arbor entrance would be a striking addition to your residence. A wide arbor, similar to in the photo, would be perfect for plant life to wrap around and create an almost storybook gateway; and a hatched gate would unquestionably increase the privacy and fascination for your garden. The Grecian, Roman appeal that this pillared arbor brings is absolutely ravishing. If you’re one for the more sophisticated things in life, this arbor may be an excellent addition to your home garden area. 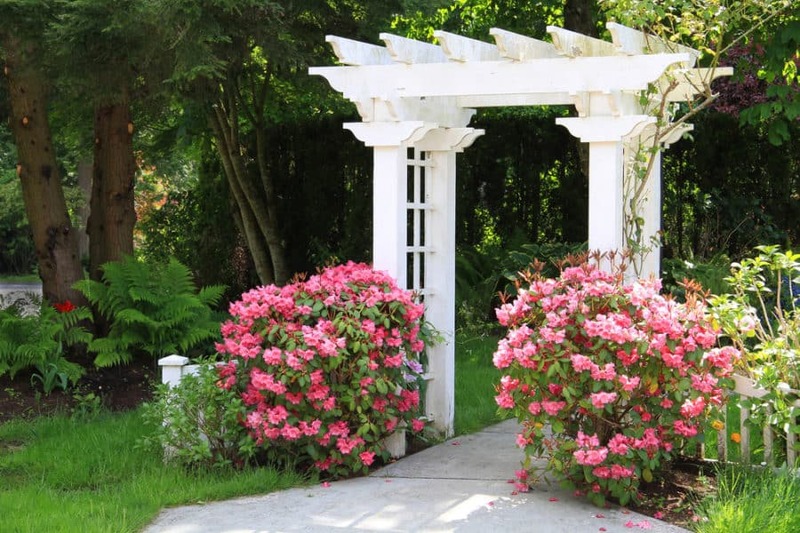 With the luscious, feminine pink rose bushes and stone appearance of the pillars, you’ll be taking your home back to ancient times. Not everyone is a fan of white, wooden garden arbors. For those who prefer sturdy, lean, metallic garden feature appearances, this black wrought iron arbor would be perfectly suited. This arbor brings a less traditional appearance to the gardens they’re present in, and they often are more durable than their wooden counterparts, lasting you years. 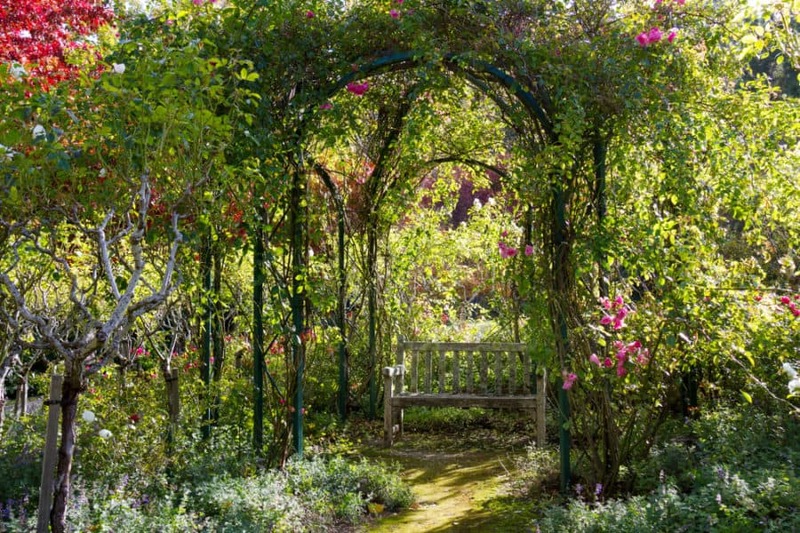 Similar to the rose-covered seating area we mentioned earlier, this flower-engulfed arbor creates a shady seating area on the path of this garden. This seating area would be great for those who either don’t have space for a large seating area, or for those who simply prefer an area to rest on their garden paths. So far we’ve listed ideas for rounded or flat-top arbors. However, this garden arbor is unique with its joining, pointed roof design. This particular design is perfect for giving your overgrown plants an odd shape as they drape the top of the structure. We all recognize the American Dream: comfortably-sized house, a little yard, and a white picket fence to wrap it up nicely with a big red, white, and blue bow. White picket fences are an adorable ideal feature for any home yard, and with a garden arbor, these property features make the perfect classic American garden combination. For the southern-hearted, this rustic arbor made of wooden beams and branches is perfect for giving your garden that countryside feeling. The simple, natural appearance blends in nicely with the surrounding wooded area. 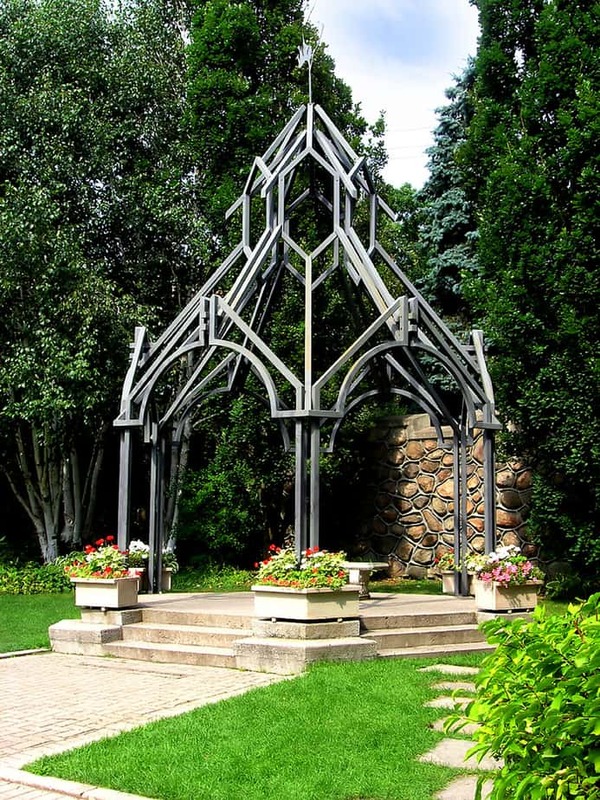 For those who adore medieval and gothic architecture, this castle-style arbor would be a marvelous inclusion to your garden area. The intricate detail and steeple-shaped top are enough to catch the attention of any pair of eyes that enters your property. 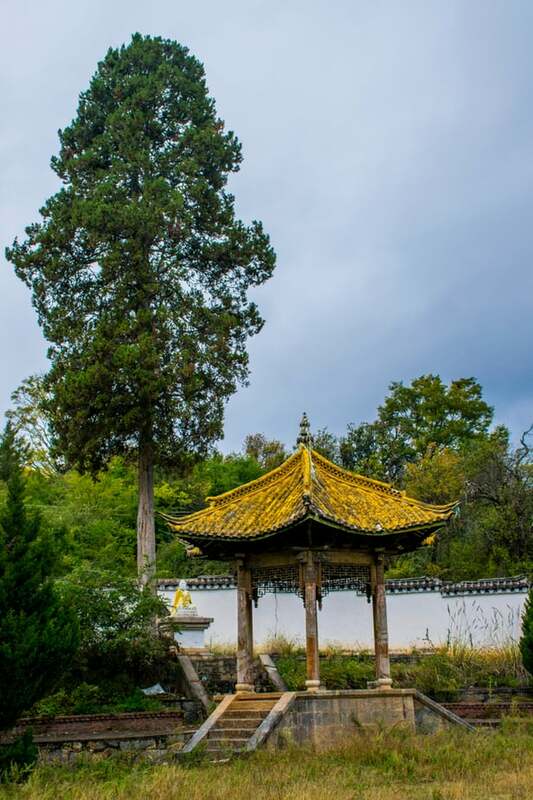 This beautiful traditional Chinese-style arbor with its brightly colored tiles and intricately shaped roof would make an outstanding addition to any garden with an Asian theme. These stone and tile arbors are incredibly durable and will last in your garden for decades. The garden arbor to the left in the photo is an antique-style arbor with a built-in sitting bench. The metal overhang creates a shady, dainty seating area and netted look of the sides gives off a vintage aura. This would be the perfect arbor for those who enjoy the appearances of “yesterday”. 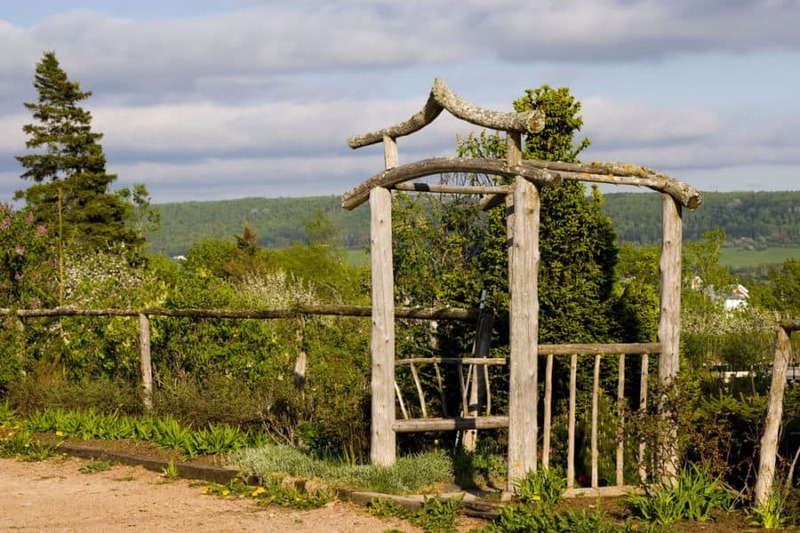 We know, we told you at the beginning that this article would be about arbors for your garden… but how could we leave out this beautiful wedding arbor? 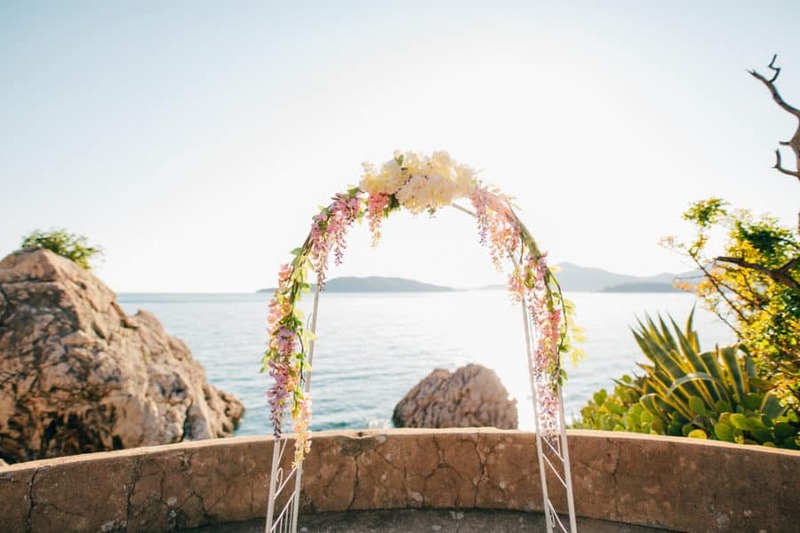 If you’re getting married soon (or you just love the look of this arbor) this white metal arbor with its beautiful design and draping lilac and white flowers would make the perfect addition to your wedding (or garden) space. If you and your family like spending time outdoors in your garden, this Asian-style arbor with a table and benches may be the garden arbor you’ve been searching for. 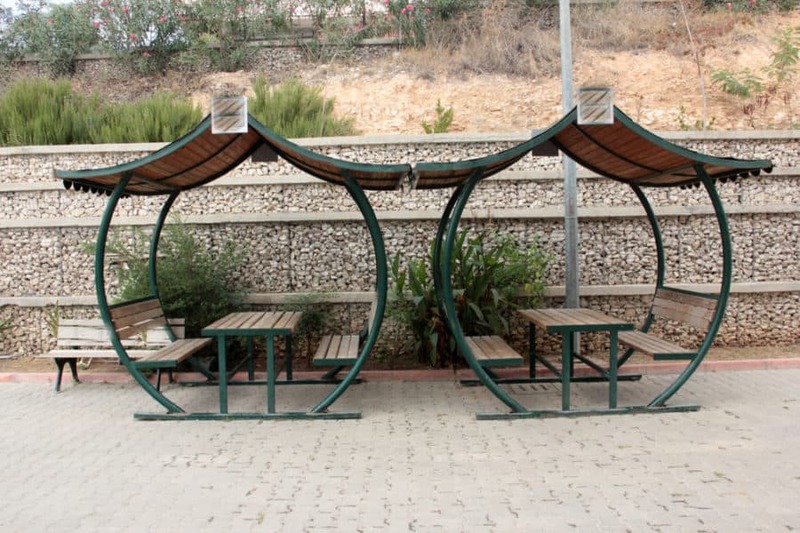 The wide-spread roofs are great for creating a comfortable shape, the seating is enough to fit four or more people each, and the tables are large enough for a decently sized picnic. What more could you ask for? 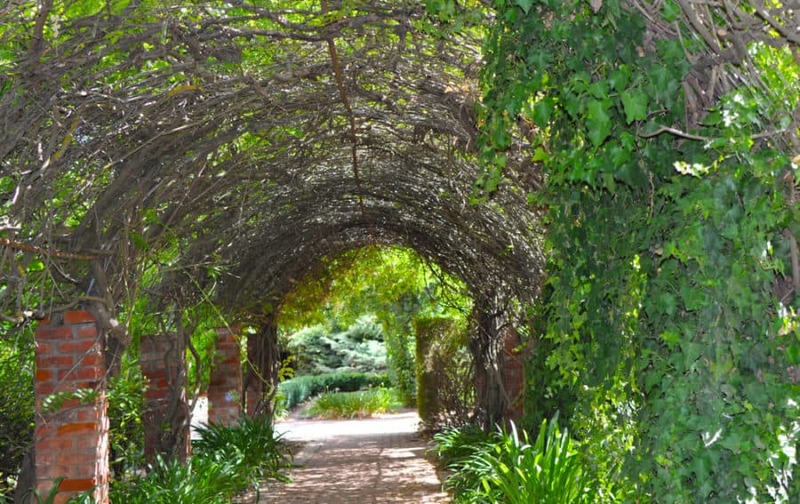 Similar to our first garden arbor idea, this caged arbor with overgrown vines creates a shady tunnel for this path. While the first example in our article was completely engulfed by plants, a caged arbor helps to keep plants from coming too far inside the walkway. 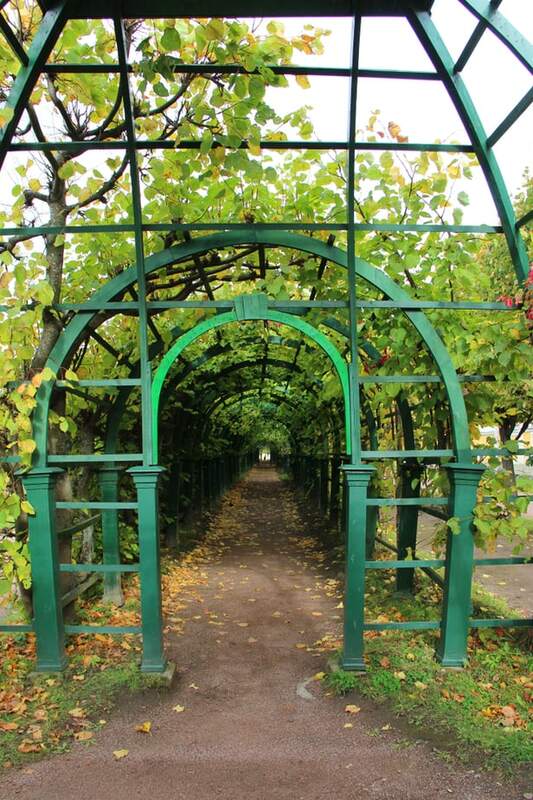 This would be a wonderful arbor tunnel for those who want less upkeep to deal with. 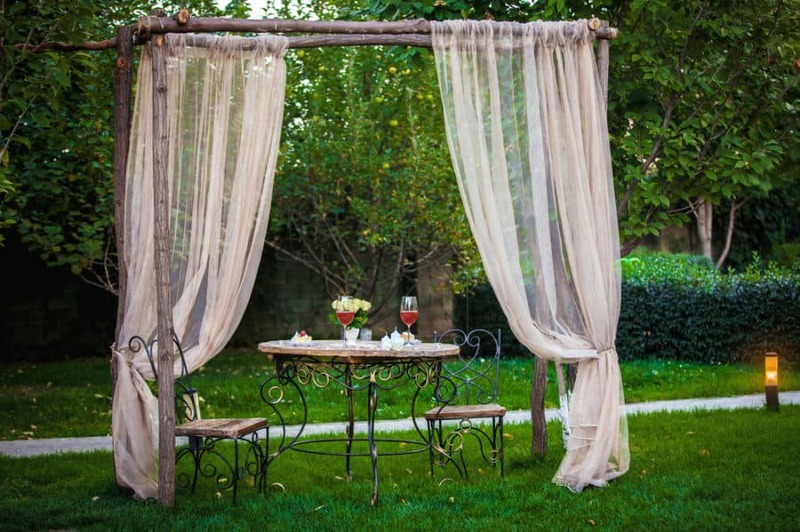 For the romantics out there, this lovely wooden arbor with off-white drapes would be the perfect setting for a picturesque evening with your significant other. The wood and iron chairs and table match wonderfully with the simple frame of the arbor and the drapes offer an airy aura to the setting. If you’re thinking of adding drapes to your arbor, keep in mind that they should always be stored when the weather is harsh. If your garden could use a little more light, wrapping string lights around your arbor will make your garden sparkle in the night. Not only will lights around your arbor provide you with more light, but when they’re incorporated with the detailed structure, the make for an eye-catching feature in your garden. For properties with creeks or other bodies of water, a bridge with an arbor can be a useful and decorative garden trait. As you cross your bridge you can stop underneath the shaded arbor, watching the nature around you and listening to the bubbling water below. To put your arbor to more than just visual use, growing an edible garden of hanging vegetables or fruits is a clever way to utilize your garden structure. 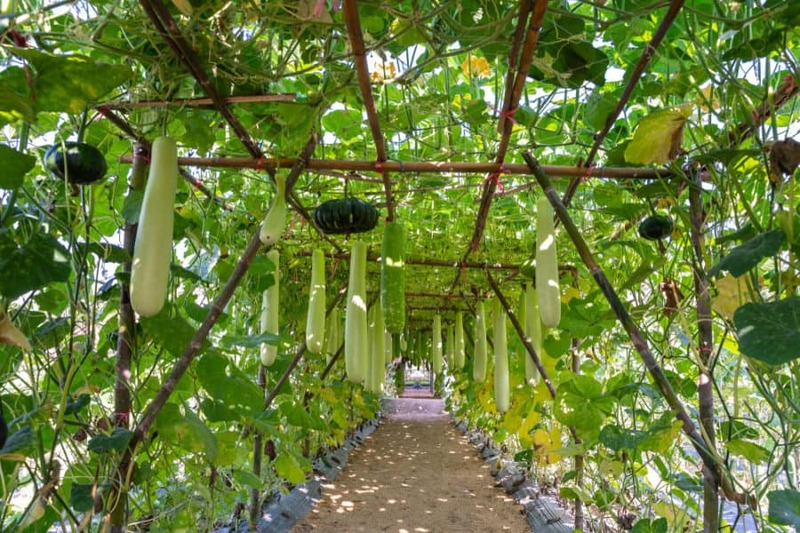 In the photo, young gourdes hang from the ceiling of the garden arbor tunnel. You could really grow quite a few vegetables this way, especially tomatoes and other plants that tend to grow up around any structure they come in contact with. This is by far the most spectacular arbor we’ve come across. This large, antique Roman or Grecian-style garden arbor with a stone staircase evokes a solemn sense of sophistication and opulence. 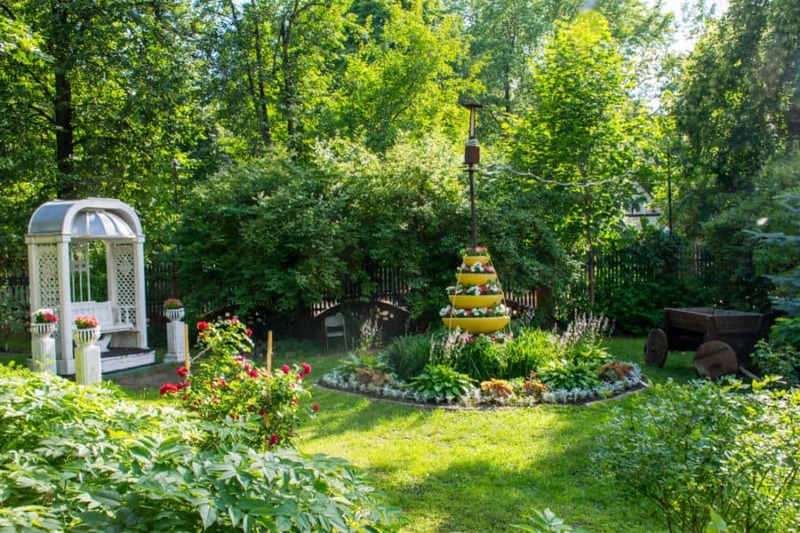 If you happen to have a hill (and the funds) t0 build a staircase into and a pillared arbor on top of, this garden feature would be an astounding addition to your property. The rustic, red appearance of the brick holding the arches of this arbor tunnel is perfect for giving a garden a more rural feel. In the photo, you’ll notice an iron netting to keep the vines from protruding too far into the walkway. Not only does this arbor walkway keep the path from becoming too overgrown, but it also creates a cool, shaded area to stroll through during the heat of the day. If you have a pond in your garden, building a path to arbors in the water would be an intriguing addition to your home. 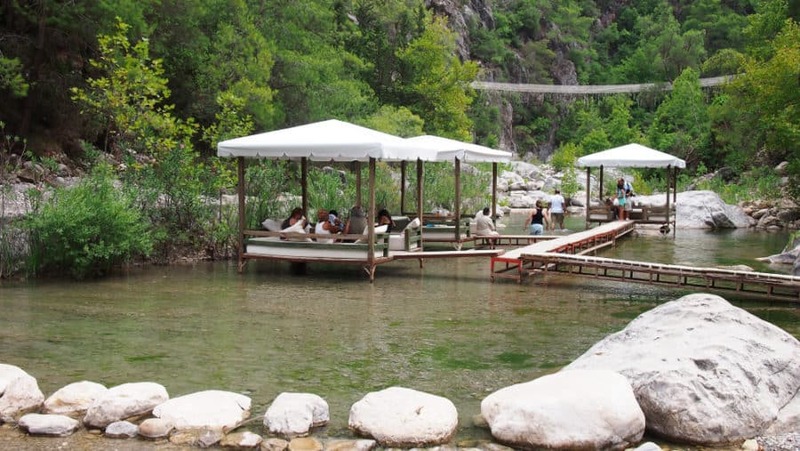 An area such as in the photo would be wonderful for those who enjoy fishing or watching insects dance above the water. Gardens are one of the most beautiful aspects of homes. The life and peace they bring to our backyards are immeasurable. Arbors have been a way to enhance the tranquility of gardens for centuries with the intricate detailing and calming shade they provide. We hope we’ve given you some arbor ideas to transform your own home garden. Happy decorating! Looking for more backyard design ideas? Check out our Front Porch Ideas, Pergola Ideas, Pool Landscaping Ideas, and Vinyl Fence Ideas articles!